Surprisingly, no death or injury. There’s one which usually follows it around about an impossible to see speed bump. I try and dig it up. 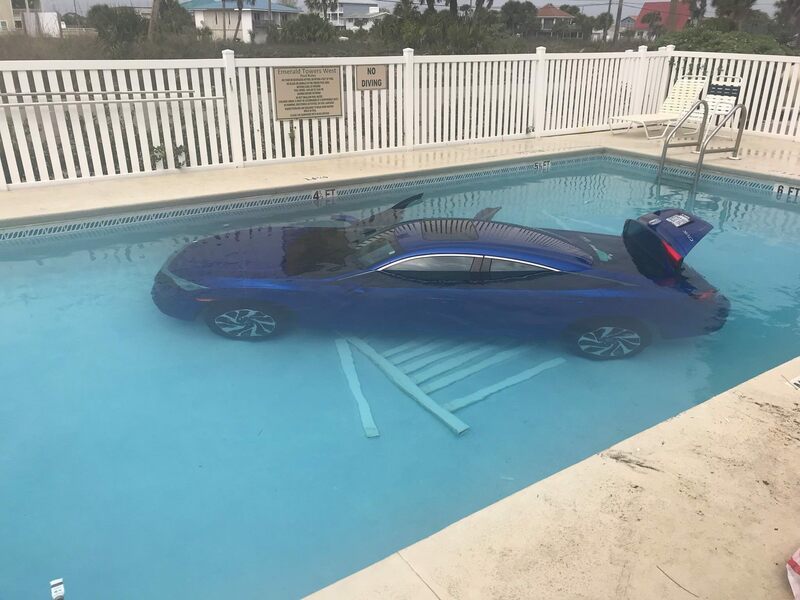 Analysis is they accidentally hit the (pedal activated) emergency brake. Am I doing the math right? That looks about 13 million watts. Max amps would be a dead short, at 0 ohms load. Their numbers suggest a line resistance of .02 ohm. If you assume 1 ohm for the person in circuit (wet hands and standing in water) with .02 ohm line resistance, you'd get maybe 460 amps at 470 volts. Amps would go up rapidly as your skin resistance failed further, while voltage would drop more slowly. The label is misused. 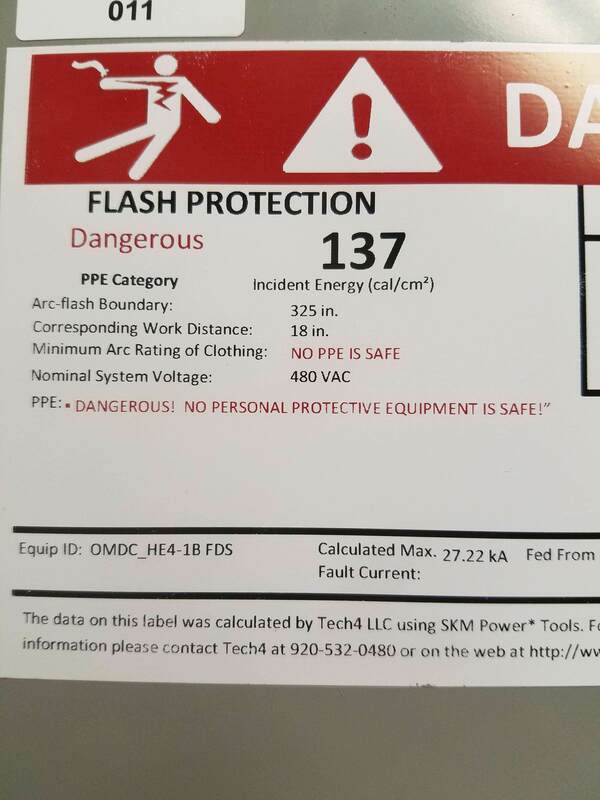 480 VAC is medium voltage according to the NEC, and personal protective equipment (PPE) absolutely works with 480. Electrical tape would be enough. Dry gloves, rubber gloves, even bare hands if you're wearing dry shoes (and only touch one leg) would work. I'd expect that label at several KVAC or higher. IIUC, the warning is because of the heat an arc fault would release. Second degree burns at 30 feet. I gather there actually is PPE which can handle what would be encountered at working range, but it won’t handle the accompanying getting blown across the room. In my experience the use of signage around dangerous electrical systems tends to be as (excuse the pun) inflammatory as possible. It either gets your attention or it's useless. Having felt what 1200 watts going through your finger tip is like (not fun at all!) from an accidental contact inside something called a "cold compartment" - without signage - I get the point. In a similar vein, I have high explosives warning labels I put on boxes of spare bulbs to incline people to be gentle. 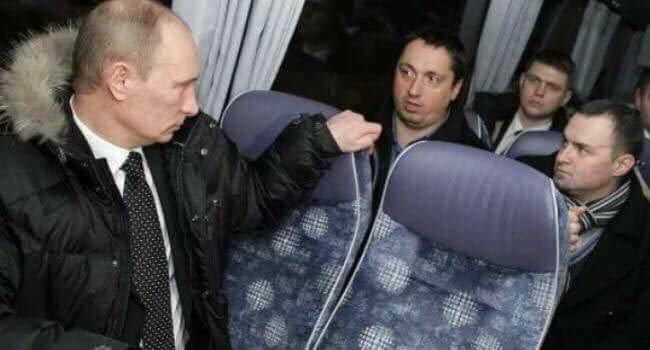 Probably not the seat you want to be kicking. I would have used a straight ladder. They wouldn't need 6 guys, just one to fetch the ladder. There aren't many swimming pools without steps. Must be a custom backyard pool. The theoretical explanation is both the kid clonked his head pretty hard falling in, and everything is covered in ice. 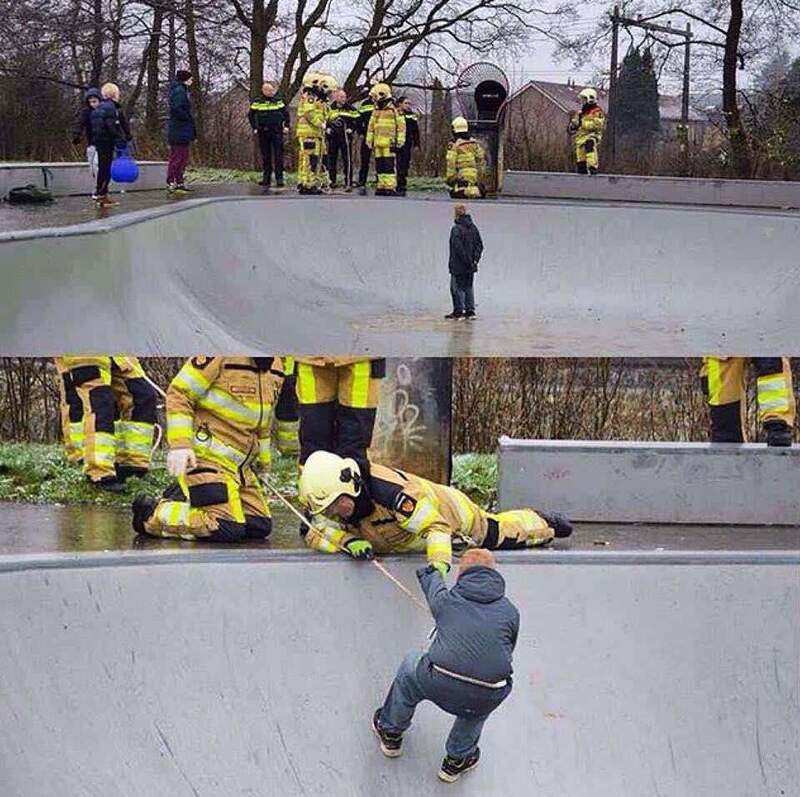 The first makes me think one of the firemen would go down, check him over, and help push him up. they could throw him a skateboard with the rope. I imagine this is a joke, but if you’re going to haul him up with his back up against the slope, which is what makes sense to me, taping a skateboard to his back isn’t the worst idea. That's not a swimming pool. That's a skatepark. “Uh, colonel. About that nice airplane you trusted me with. Well there was this little problem, and...oops.” I would not want to be that pilot, even if he did everything 100% right. IIUC (which appropriately in this situation, autocorrect wants to change to “ouch”) an engine went out due to mechanical failure, which would have been recoverable if he had more altitude. He tried hard to recover. The stopwatch says he hit the eject 1.9 seconds before impact. Impressive he could eject sideways so close to the ground and land in one piece. It looks like the pilot initiated the ejection only after he was confident the aircraft was going down in the infield and not on a runway (or in a crowd). I still wouldn't want to be him, but I have to take my hat off to him. Modern fighters feature what's called a "zero/zero" ejection seat. The name refers to zero altitude, zero speed, and indicates that the seat will work correctly even if it is actuated sitting still on the tarmac. The sideways nature of that ejection is certainly remarkable. but notice that you can see the seat's rocket motors orient the pilot more vertically and then get him going straight up. This is how it actually saved his life. The seats in the FA-18 are called the Mk 14 NACES (Navy Aircrew Common Ejection Seat), built by Martin-Baker and are of the latest generation of zero/zero seats in US operation. USAF uses ACES (Advanced Concept Ejection Seat) models, made by United Technologies (originally developed by McDonell-Douglas); currently the F-16, A-10 and F-22, along with both the B1 and B2 use the ACES II seat. Wiki says that the minimum altitude for an ACES II seat to work INVERTED is 140 feet at a speed of 150 knots. (let that sink in...at 140 feet, the seat will get you out from under the airplane and then to an altitude that the parachute will save your life. I can't find any specifics for the seat in an FA-18, but I'll bet they're very similar. A very spectacular whoops, but fascinating for all the tech that went into saving lives - both the pilot's and anyone else's around the incident. Apart from the fact that he came down hard on that tarmac. July, 2010. Lethbridge County Airport, Alberta. You posted while I was adding an extra bit to my earlier post... Good catch. Luckily (?) he probably wasn’t concious at that point. A nice hot day and a couple of hair dryers and she’ll be juuuuuust fine. Trunk stuff, car stuff, car itself...it's all wrecked. That won't buff out, though there's probably a little bit of salvage value in there somewhere. Not enough to pay for the MUCH higher insurance he just earned himself. Good job, Spanky! I like the guy who decides mid-stride “not today”. he was on a cig break anyway. Yeah...They do build their bridges right, that's for sure. Wherever that is. How the hell does something like that happen? I mean, how do you drive down a highway and not know your cargo bed is still elevated? Also it seems like kind of a dumb idea to drive directly in the Splash Zone™. The highway sign points to a lane for Quebec.